Soak in stunning views from your treatment room, indulge in Provencal inspired rituals with our Shea from Burkina Faso and Immortelle from Corsica, feel the gentle warmth of your private steam chamber, spend soulful moments in the oversized Couple’s Suites, embark on a journey of sensorial delights and pamper yourself with treatment protocols that incorporate the best of the west and the east; with Swedish, Hawaiian, Lomi Lomi, Balinese & Shiatsu combined in exclusive L’OCCITANE sequences.The Spa brings to life the changing seasons of Gulmarg with signature treatments where guests are encouraged to choose from a repertoire of home grown seasonal flora which are mixed with natural L’OCCITANE products and fresh Himalayan water to create fusion recipes, a-la minute for the treatment. Prior to your treatment, you are greeted with a “Welcome Ritual”. Your experience then takes you on a true olfactory journey, sequenced at every step by soothing or energizing aromas.The voyage of the senses continues through gestures, sensorial textures, relaxing music and the herbal teas inspired by Provencal traditions. 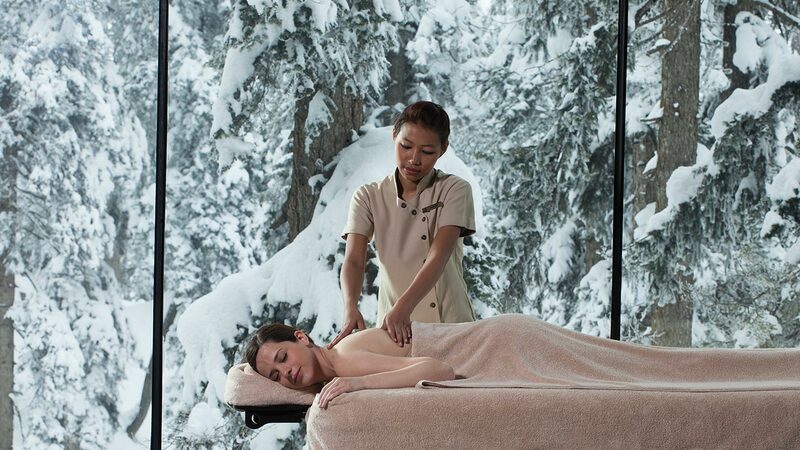 The Spa is a natural extension of our brand. In respect for authenticity, we always prefer hand performed treatments over machines and traditional massage techniques over technologies. A high-precision treatment to combat the effects of time and sun exposure and reveal a bright,luminous complexion. To correct and prevent the appearance of dark spots, the lifting treatment with Immortelle is combined with a formula enriched with Vitamin C derivative and Bellis Perennis. To deliver ideal moisturization, this refreshing facial incorporates two organic angelic extracts – water and essential oil. Their patented complex helps the skin regain its natural vitality and suppleness. Featuring our signature drainage face massage sequence, it leaves the skin smoother, re-plumped and more radiant … purely glowing with beauty! Produced by the women of Burkina Faso using traditional methods, Shea butter repairs, moisturizes and restores balance to dry or overworked skin. Massage further heightens these properties and stimulates microcirculation. A targeted treatment for men's skin; with fresh spring water, organic sea-buckthorn, peppermint and Genepi. A draining massage helps eliminate toxins and excess sebum, to leave skin purified, invigorated and glowing with health. Swedish effleurage strokes, Chinese acupressure and Balinese massage techniques come together to stimulate circulation and ease tensions. Aromachologie essential oils – Lavender, Tea tree and Geranium – ensure complete relaxation. The body and mind feel truly calm and you can sleep peacefully. The Revitalizing Body Massage combines gentle Swedish effleurages, deeper-pressure Lomi Lomi and Balinese movements with the invigorating blend of Mint, Pine and Rosemary essential oils. First, the massage focuses on the left side of the body, the side of the heart, to gently stimulate the acupuncture meridians from head to toe. Then the right side is treated to ultimately release all the energy from the body. Feelings of fatigue or weakness simply disappear! This treatment combines the Hawaiian Lomi Lomi massage, acupressure and gentle stretching. A deep-tissue massage and soothing essential oils ease muscular tension, with a focus on the back, shoulders and nape of the neck. Perfect for relaxation after a long journey. Strengthen your skin with signature blend of Lemon Balm essential oil and L’OCCITANE Neutral Oil, blended with signature massage techniques based on Swedish, Balinese and Acupressure, to invigorate and revive inner energy through senses. To dispel stress and tension and restore the body’s balance, Swedish effleurage strokes are used in combination with the penetrating warmth of basalt stones and L’OCCITANE revitalizing essential oils. Warm stones are placed on the seven chakras, which, according to Oriental tradition, are key centers of energy. The perfect ritual for sports enthusiasts or those with a hyperactive streak. Feel the textures of apricot powder, Himalayan mineral rich spring water and gentle touch of Lemon Balm essential oil in this unique scrub. This refreshing formula exfoliates, softens, smoothens and is then followed by our award winning Shea body lotion to moisturize and nourish the skin. As a result skin is instantly revived and left smooth and glowing. This delicious texture enriched in nourishing Shea butter eliminates dead cells, leaving skin satin soft and perfectly prepared for a treatment or massage. A firming scrub which exfoliates and stimulates micro-circulation using a delicious Almond paste that contains crushed almond shells mixed with sugar crystals. It is then followed by the application of Almond Milk Concentrate enriched with almond oil, almond milk and almond proteins, leaving the skin satin soft. Indulge in the bliss with the pampering touch of Sandalwood, Himalayan clay and reviving Lemon Balm essential oil. Award winning Shea butter nourishes, natural spring water of the Himalayas replenishes the minerals and Lemon Balm purifies. The foot and scalp massage during the wrap ensures deeper relaxation followed by a treat with L’OCCITANE Shea body lotion that nourishes and moisturizes better and deeper. An expert body wrap to tone the skin, stimulate fat release and promote toxin elimination. Almond tree bud extract rich in flavonoids to drain excess fluids is associated to a plant-based complex and Almond proteins to firm and redefine body contours. While the wrap is on, a relaxing foot and scalp massage instills a feeling of complete well-being. Inspired by lymphatic-drainage massage techniques, this treatment boosts circulation and helps rid the body of toxins.The Almond Supple Skin Oil and its unique association of powerful almond proteins and oil and essential oils of peppermint, palmarosa and Immortelle, heighten and prolong the effects of the massage for a lighter and an invigorated skin. A treatment that’s ideal before summer and after pregnancy, to treat cellulite and restore firmness to the body. It begins with a draining massage focused on the thighs, stomach and buttocks. The Almond Supple Skin Oil acts on skin elasticity and helps prevent the appearance of stretch marks. Then the patented complex in Beautiful Shape combines the contouring, antiwater retention and antifat storage properties of almond proteins, essential oils and caffeine. Before, after or during a treatment, discover a few additional pleasures created by THE KHYBER SPA by L’OCCITANE for her and him. The ideal treatment for travelers, rough feet and heavy or restless legs. For the legs; a massage that stimulates drainage. For the feet; a massage with Shea butter to nourish the skin. An exfoliating and purifying back treatment, ideal before a special occasion. Exfoliation is followed by a clarifying treatment or a relaxing massage and a hydrating or moisturizing mask. To fight fine lines, dark circles and puffiness and give an instant radiance boost, this treatment features a lifting massage and an Immortelle formula specifically designed for the eye area. Perfect after a journey, a night of festivities or even a long, hard week. 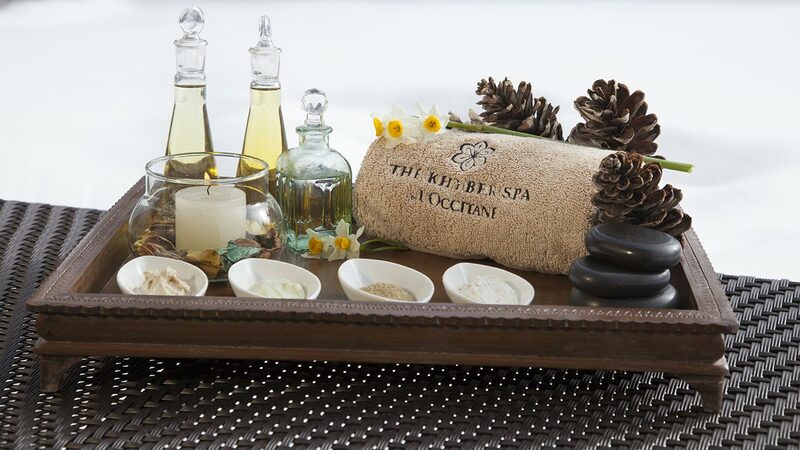 A pampering session to relax those tired legs using the Revitalizing Aromachologie Oil. A moment of gentle warmth in your private steam chamber during which pure essential oils (chosen according to your mood and skin’s need) are diffused into the atmosphere in your private steam chamber. The emollient properties to the steam allow the skin to perfectly enjoy the benefits of the treatment. The well-being bath provides a delicious and relaxing prelude or finale that leaves the skin and the mind perfectly prepared and truly receptive to the benefits of a treatment. Every new project is an opportunity for L’OCCITANE to go a step beyond in the commitment for social responsibility. A Spa, because it is heavily water oriented, has to limit waste through constant controls and continuous consciousness. We strive to maintain a green environment. For this reason we select natural materials with traceable origin (eco-friendly whenever possible) and save energy through controlled use of utilities. With features such as our in-house laundry we ensure you only get the purest linen and the most hygienic experience. This way, L’OCCITANE Spas curb our impact on the environment. Nestled in the Himalayas, 8,825 feet above sea level and ensconced amidst unspoilt acres of meadows and pristine nature, lies THE KHYBER SPA by L’OCCITANE, one of India’s most luxurious and holistic well-being experiences.